Ben Affleck is fighting to save lives in the Congo. Many believe he is one of those rare respected Hollywood types who does not wake up every morning driven by his ego to land the next big box office hit. He wakes up possibly thinking about the world his children will grow up in as well as children around the world. Ben Affleck has been reportedly active in the political arena and now he is expanding his consciousness globally to areas that are suffering. As Hollywood continues to wheel and deal, Ben Affleck is on a mission. Many remember the Oscar nominated film Hotel Rwanda starring Don Cheadle and the high emotion it stirred in people around the world. Much of the public in the United States left the theater as the credits rolled wishing they were made aware of the suffering and genocide that was taking place to millions of Rwandans. It is no secret that the Congo has been in the news for many years, but the severity of what is reportedly taking place in eastern Congo might not be communicated via the media. Suffering human beings should not have to wait on the big screen to tell their story or an Oscar nomination to receive help. According to ABC News, five million people were murdered in the “war ravaged” country of the eastern Congo since 1998 leaving over three million still trying to put their life back together to find places to live in 2014. The report goes on to say Affleck has made nine trips to the Congo hoping to get Capitol Hill to put pressure on the government of the Congo to bring change to save the millions of surviving lives traumatized by the genocide. Reported in the New York Daily News, Affleck is suggesting that agricultural aid, assuring fair elections, and cleaning out the corruption in government will bring improvement to eastern Congo. Affleck let Washington know that he doesn’t want his legacy as a man to be how much money he made in Hollywood. He wants to leave a legacy that he fought to save lives in suffering countries such as the Congo. 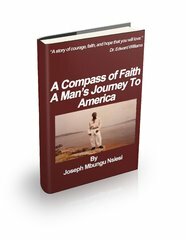 Joseph Mbungu Nsiesi, author of the book A Compass of Faith: A Man’s Journey To America, is a native of east Congo who had to flee from his country after the government allegedly put his name on a hit list in 1992. The book describes the condition of the Congo from the eyes of Joseph Mbungu Nsiesi. He reports in the book how officials and thieves blocked him from attending school to get an education unless they were offered a bribe. He eventually dropped out of school to work the family business that was robbed of everything forcing him to close the store down. He goes onto report his family as well as millions of others went hungry without much hope of surviving. They could not rely on the assistance of the police because the government is very corrupt. In interviewing Joseph Mbungu Nsiesi, he tells the story of how he joined organizations to try to bring his people together to fight for justice and the right to live. He was warned that his name had been put on a hit list with government officials making visits to his family’s home looking for him. For his family’s safety and to find a way to live, he fled the east Congo on a boat (baleniere) to sail up the Congo River for a month without food or water. A traveling friend died next to him on the journey from an unknown illness. Nsiesi grew fatally ill with the same bleeding and excruciating stomach pain his late friend suffered from on the river. He says his spiritual faith kept him alive. Nsiesi came face to face with death, thieves, and racism on his journey to freedom eventually attaining a passport to the United States. Joseph Mbungu Nsiesi, now a registered nurse in Los Angeles, California offering assistance to Congolese with the non-profit organization The Nsiesi Foundation for Disease Prevention in the Congo, is just one survivor who has lived to tell his story here in America. Ben Affleck is possibly hoping to use his star power to save millions like Nsiesi just wanting to make a life for their families. As much as many Americans enjoy following the lives of the rich and famous thanks to the paparazzi, one question that is looming over much of the public is why isn’t the paparazzi following Ben Affleck to the Congo? Many believe Ben Affleck is setting an example to the entertainment industry on how to use the privilege and influence they have been given to take on the biggest role of their life…being human.